Noto, Wajima one day bus tour | Why don't you go on a trip to Japan? It was the second day on my Kanazawa trip. I wanted to visit to Wajima located in the north of Noto Peninsula in Ishikawa Prefecture in this time but it is quite far from Kanazawa city. It will take about more than two hours by train from Kanazawa city center. As we can go sightseeing there in one day trip, I recommend this bus tour to those who doesn’t have time enough. 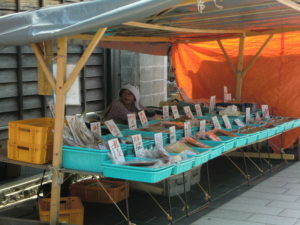 The morning market is the one of the famous spot at Wajima. I wanted to visit. I made the reservation at a bus company in front of the Kanazawa station. I went to the meeting place Kanazawa station east exit at No.1 bus stop in 10 minutes departing time. There were 7 guests including me this day. This Wajima tour is daily operating, even if only one customer. A driver and a bus tour guide are the crew. The bus runs almost on the highway from Kanazawa station to Wajima and we had some short breaks on the way. It took about 2 hours get to Wajima. Wajima is a small local seaside town located at the top and north of the Noto Peninsula. 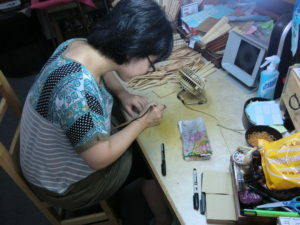 Speaking of Wajima, lacquerware is famous as traditional crafts called Wajima-nuri. Although the production of lacquerware in Wajima dates back to ancient times, it is said that the current technology was established in the Edo period. 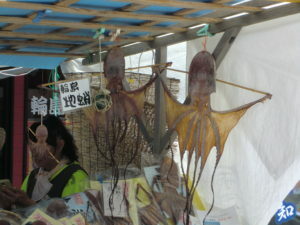 The first place we visited was the morning market. More than 200 stalls line up on the street lasting about 360 meters, and many kinds of products such as lacquerware, fishes, vegetables and like line up. It can be discount so you can ask the shop owner. I bought chopsticks made of lacquer carved my name on the chopsticks. The market opening time is 8 am to noon. 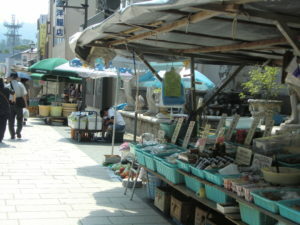 It is said Wajima morning market is the one of the three largest morning markets in Japan, and it is famous as a sightseeing spot. The street is narrow so we got off the bus and walk. We got a free time walk for about 40 minutes. Return to the bus and go to the next destination, Shiroyone Senmaida. 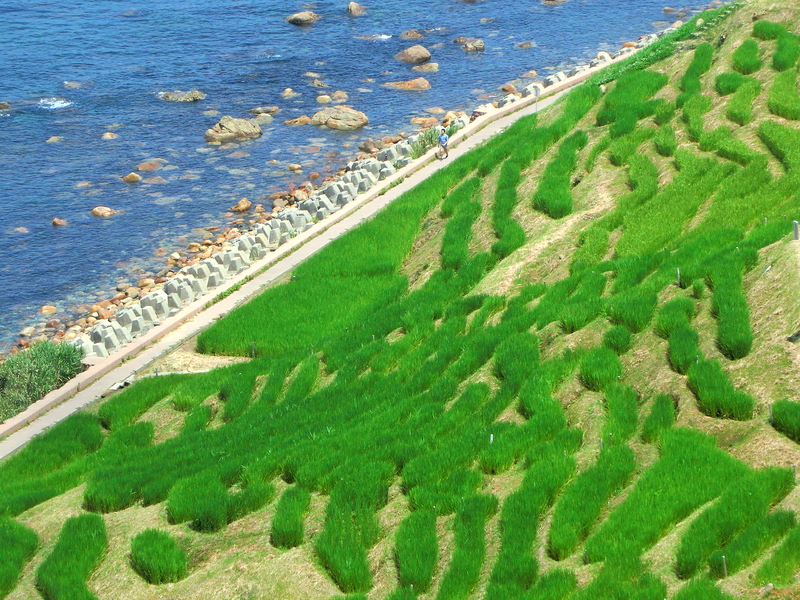 Shiroyone Senmaida is a rice terrace along the coast which is about 15 minutes by bus from the morning market. 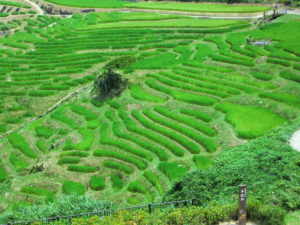 Each small rice fields overlapping and continue to the coast is beautiful scenery looking down from observation deck. 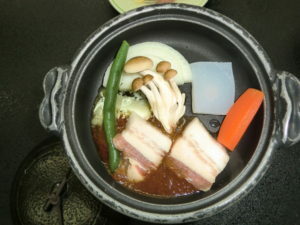 In June 2011, it was recognized as the world’s agricultural heritage which is the first place in Japan. Next we were going to a hotel to have lunch. 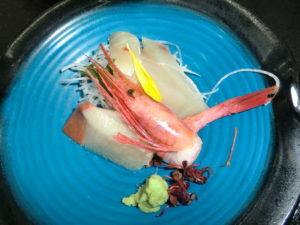 The menu was Japanese food such as sashimi, pot, etc. Then stop by Wajima Kiriko Kaikan (WAJIMA KIRIKO ART MUSEUM). 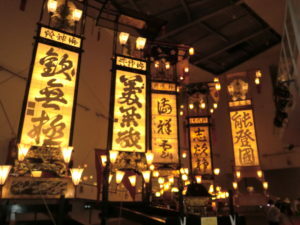 Kiriko is a gigantic lantern basket in a word, and the bigger Kiriko deserves a fourth floor of a building. 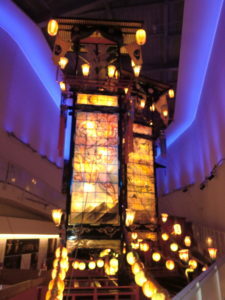 The exhibited Kiriko which was actually used at the festival. During the period from July to October every year, Kiriko Festival will be held in more than one hundred dozen districts of Noto. Leaving Kiriko Art Museam, we return Kanazawa. On the return way the bus run ‘Chirihama Chiri Hamana Nagisa Driveway’. 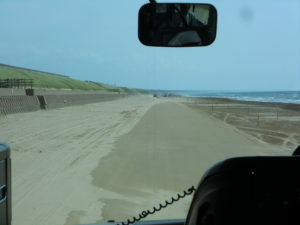 This is a special road of about 8 km extension on the sand beach. 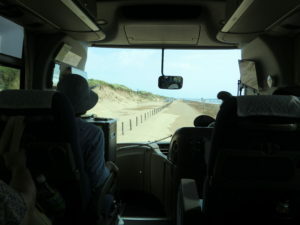 It is the only road in Japan that can run on the beach at the coastline with only general cars and buses. Such a road is unusual worldwide, it is said to be only three places including American Daytona Beach, New Zealand’s Waita Lele Beach. It was a pleasant day as the weather was nice. I was impressed that the bus runs on the beach and had a strange feeling when a wave came nearby the bus. And the bus come back to Kanazawa station around 4:30pm in the evening time. Tour guide will explain each sightseeing spots in the bus but it is only in Japanese. You can make reservations and purchase tickets at the Hokuriku Railway office located at the bus terminal. 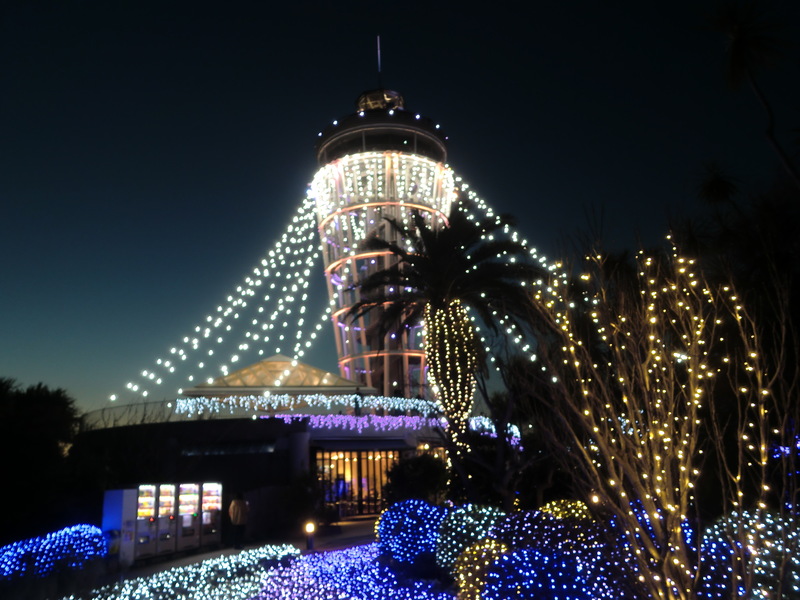 I think it is ideal for efficiently sighseeing around attractions of the Noto Peninsula.